We all are familiar with the Retina screens on tablets and computers that many of us use on a daily basis and we associate it with the latest on the technological arena. The thing is that the human has its own Retina display, which is the human’s “window” to the visual world. In 2002 David Berson vid Brown University, US, discovered a new light sensitive cell in the eye, which does not give visual information. Instead it stands in direct connection with the SCN, often referred to as the biological clock. Natural sunlight has a continuous spectrum, while artificial light lacks many frequencies that the human body requires for essential functions. The human organs are orchestrated to work in harmony with each other, generating a body rhythm that is set everyday by daylight. 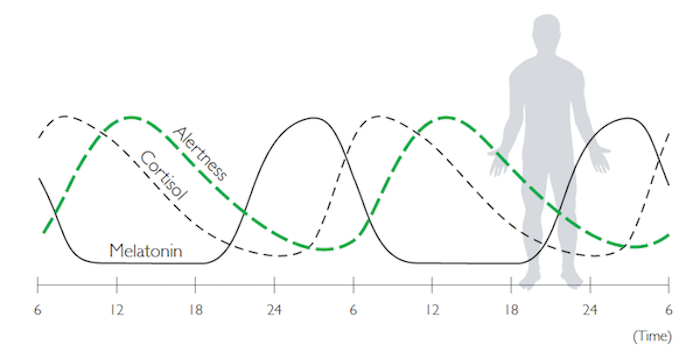 This rhythm is called the circadian rhythm and includes production and secretion of hormones to regulate functions such as body temperature, awareness and immune system activity. Source: Berson, D.M., Dunn, F.A., and Takao, M. (2002). Phototransduction by retinal ganglion cells that set the circadian clock. Science 295, 1070–1073.